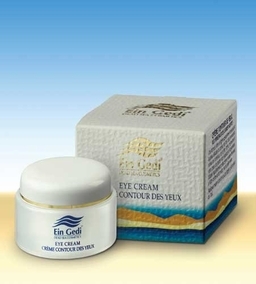 This eye cream contains active mineral ingredients from the Dead Sea. The uniqueness of many Dead Sea cosmetic lines lies in the key ingredient - mineral mud. The rejuvenating minerals of the Dead Sea combined with plant extracts and aromatic oils form the basis of an innovative and advanced approach to skin-care. Since ancient times, it has been known that extracts of Dead Sea minerals cleanse and purify the skin. Studies have shown that Dead Sea products have a marked anti wrinkle effect. Products include Dead Sea cleansers, nourishing creams, moisturizers, foot creams, hand creams, eye make-up remover, skin toners, astringents, face wash, spot treatment, bath and shower gel, stabilizing ampoules, sun protection creams, and soaps. Use in the convenience of your home for the relief of various aches and pains, for softening scaly, dry parts of the body, such as knees and elbows and for effective treatment of various skin and scalp problems. Used on the scalp, it helps thicken roots enhancing renewed growth.